In this tutorial we will add icons to your navbar. 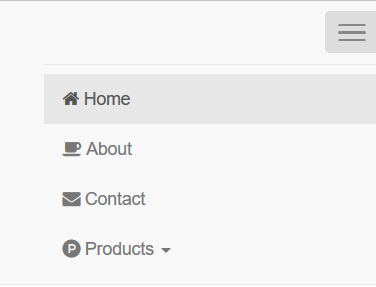 In the previous tutorial we added a responsive layout with bootstrap. In this post we will add some icons to your navigation. Font-Awesome gives you professional looking vector graphics, which are implemented using CSS. Bootstrap 4 uses Font-Awesome as it's icons. Glyphaicons will goes away. So we might as start using it. Just to review this is how our layout looks like in our previous post. We are going to add font-awesome icons to the first level of the navigation links. You can decide what icons goes into the products drop down menu. 1. 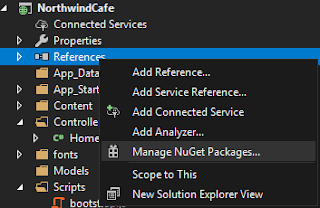 Open the NorthwindCafe.Web project and add the font-awesome library by launching the Nuget Package manager by right-clicking on the "References" node and select "Manage NuGet Packages". 2. Once the Nuget Package manager is opened make sure the "Browse" tab is selected, then type "font-awesome" in the search box. 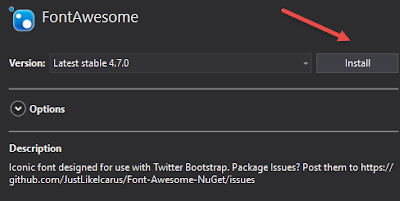 Select the result that says "Font Awesome for Twitter Bootstrap"
4. We are ready to add some icons to your navbars now. Font-awesome is really easy to use first we need reference the font-awesome.css file. We could create a new Bundle Config for the font-awesome, but it is much easier to it in in our _Layout.cshtml file so that we can use it through out the site. Add the following line to between the <head> section of the layout page. To add a font-awesome to your website you just need the <i> tag with the class being the font-awesome class name for the icon that you want. Since the home icon has a class name of "fa-home", the markup is <i class="fa-home"></i>, the aria-hidden="true" is for assistance accessibility technology to ignore it. So that it does not announce the the icon to the world, since it's purpose is only for decoration and has no other meaning. 8. 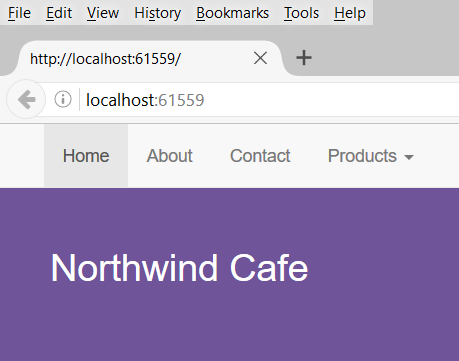 To add the home icon to the NorthwindCafe.Web project, open the _Layout.cshtml page. Then next to the home navigation link add the icon with the following code. 9. I have choose the fa-coffee for "About", fa-envelope for "Contact" and fa-product-hunt for "Products"